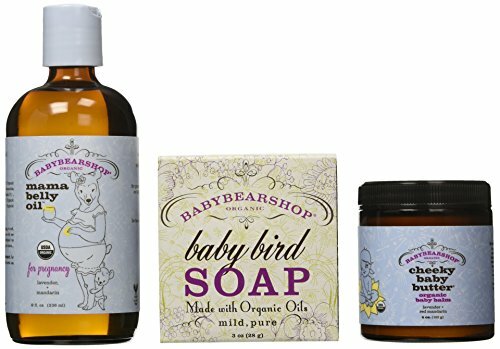 BABYBEARSHOP's signature product and best seller, Cheeky Baby Butter and reg; is USDA certified organic with 100 all-natural ingredients and is an all-purpose, nutrient-rich organic baby butter. It is hydrating, exceptionally gentle and calming, excellent for dry skin, hands, feet, knees and elbows. Originally formulated for babies, our Cheeky Baby Butter and reg; can be used by children and adults. For parched mamas; use on dry skin, wrinkles (not that you have any), scars, stretch marks and dry hands. For tired mamas + babies use as a nutrient-rich hydrating massage cream. Babybearshops Cheeky Baby Butter is USDA certified organic with all-natural ingredients and is an all-purpose, nutrient-rich organic baby butter. It is hydrating, exceptionally gentle and excellent for dry skin, hands, feet, knees and elbows. The balm is perfect for adults and children and holds many functions, such as a massage cream, lotion and more.Size: 4 ouncesIngredients: Butyrospermum parkii (shea butter) fruit, helianthus annuus (sunflower) seed oil, rosa canina (rose hip) fruit oil, copernicia cerifera (carnauba) wax, theobroma cacao (cocoa) seed butter, persea gratissima (avocado) oil, cocos nucifera (coconut) oilThe content on this site is not intended to substitute for the advice of a qualified physician, pharmacist, or other licensed health-care professional. The products may have additional information and instructions on or inside the packaging that you should carefully read and follow. Contact your health-care provider immediately if you suspect that you have a medical problem. This product may not have been evaluated by the Food and Drug Administration and is not intended to diagnose, treat, cure, or prevent any disease or health condition.Due to the personal nature of this product we do not accept returns.We cannot accept returns on this product. The BabyBearShop Mama + Baby Daily Indulgence Collection will delight any mama or mama-to-be. 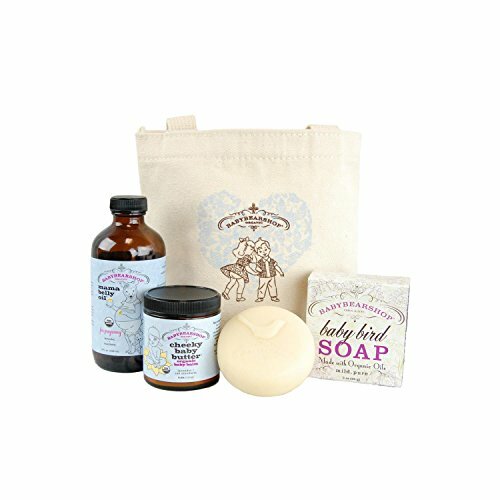 Inside our Organic Cotton Tote, you'll find some of our best-selling USDA Certified Organic, 100% Natural products, including our Cheeky Baby Butter, Mama Belly Oil, and Baby Bird Soap. The Cheeky Baby Butter is an excellent all-purpose creamy butter that's great for baby massages, treating delicate dry skin, and soothing eczema, while our Baby Bird Soap is designed to clean delicate baby skin without irritating it. 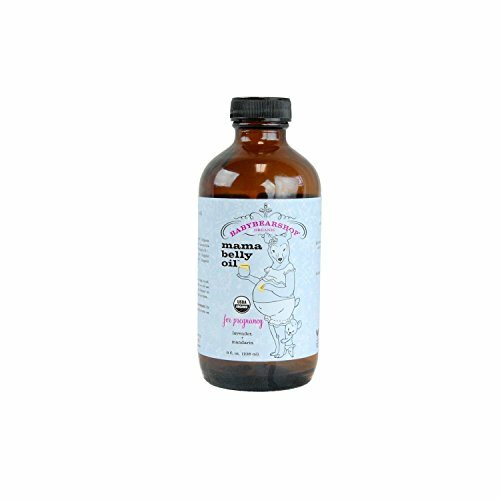 The Mama Belly Oil from BabyBearShop is an organic body oil that helps prevent stretch marks during pregnancy and can be used to treat damaged skin. Everything in this luxurious collection is 100% Natural; no parabens, no synthetic fragrance, no artificial colors, no common allergens, and no artificial anything. As an added bonus, all these fabulous products fit inside an attractive organic cotton tote for easy travel and storage. Like all BabyBearShop products, this tote is certified cruelty-free and made in the USA. To protect blossoming skin against stretch marks, to use on mama - to - be: for protection against stretch marks, apply generously on belly and body, breathe deeply and think positive thoughts for your baby. To make relaxing baths: pour three capfuls into warm water, lie back and enjoy your serenity or use on skin after shower to hydrate and glow. For blissful mama and baby massage: for mama: have someone you love massage those tired muscles and feet. For baby: soothe and bond with your little one through massage. Looking for more Cheeky Baby Butter similar ideas? Try to explore these searches: Small Indian Knife, Mickey Mouse Uncle Sam, and 13 Vanity. Look at latest related video about Cheeky Baby Butter. Shopwizion.com is the smartest way for online shopping: compare prices of leading online shops for best deals around the web. 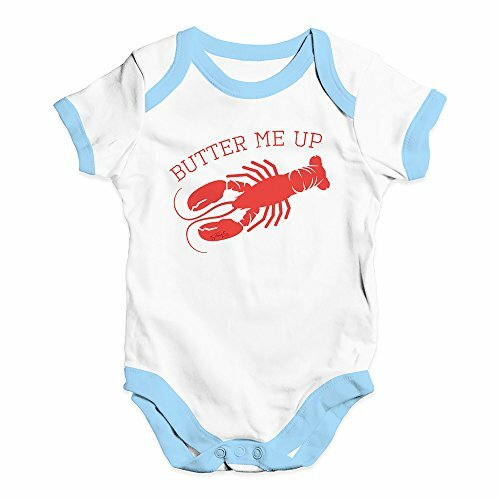 Don't miss TOP Cheeky Baby Butter deals, updated daily.